The 6 litre Spray Foam Fire Extinguishers from Firechief are the main competition for the water based extinguishers and provide a fast and effective means of tackling Class A and Class B fires. They come fitted with a special spray nozzle allowing them to be used close to electrical equipment, but should never be used directly onto an electrical based fire. They are the perfect accompaniment to a CO2 fire extinguisher. The FireChief fire extinguisher is constructed from aluminium and is light weight, ruggedly constructed and comes with a 5 year guarantee as standard. Foam fire extinguishers work by effectively extinguishing the flames and then sealing in any potentially dangerous vapours from the blaze. 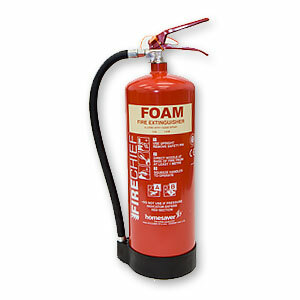 Most foam extinguishers are AFFF which stands for Aqueous Film Forming Foam. They are highly effective against petrol and other volatile liquids, forming a flame smothering seal over the surface and then also preventing re-ignition. For the modern office, shop, nursing home or hotel it is well worth buying a foam fire extinguisher as it can tackle multiple classes of fire and is a lighter weight for the same fire rating in comparison to a water extinguisher. You are under no obligation to buy from your servicing company and will in almost all cases find the exact same fire extinguisher cheaper on our site. You may already have a AFFF foam fire extinguisher manufactured by Thomas Glover which was supplied by your servicing company. Dig out the receipt and check the price. Just make sure you are sitting down when you compare the price to ours!! !